This Sunday’s Gospel is taken from the famous “Bread of Life” discourse. We find Jesus being questioned by the Pharisees after he fed the multitude. The story of this miraculous feeding occurs in all four Gospels, and takes place near the Jewish Passover festival. In John’s version, the Pharisees ask why Jesus calls himself the bread of life. Jesus answers them by referring to sacred history. At the prayer of Moses, manna, a bread “from heaven,” was given to the Israelites. They ate this bread, but it did not give them eternal life. For St. Paul, the Christian experience closely parallels the desert experience of Israel: Christians have been led out of slavery to sin and into new life in God since Christians are fed with the spiritual food and drink of the Lord’s Supper. In casting himself as the second, greater Moses, Jesus is saying that his own flesh is that eternal, life-giving bread promised to Israel in the desert. Jesus, the perfect expression of divine love, gives himself as the food that satisfies perfectly and forever all human desire. Jesus is the one who has made God known to us. As John’s Gospel says: “No one has ever seen God, but the one and only Son, who is himself God and is in closest relationship with the Father, has made him known” (John 1:18). The Scripture readings for the feast of the Most Holy Body and Blood of Christ, or Corpus Christi, point to the primordial ecclesial awareness of Christ’s eucharistic presence at the center of the Church’s worship. St. Paul, in addressing his congregation in Corinth, assumes as background the Christian Church’s knowledge of the liturgy and of Christ’s eucharistic presence. Paul writes to the Corinthians (1 Corinthians 10:16-17), asking them rhetorical questions: Isn’t the eucharistic cup a participation in Christ’s blood? Isn’t the eucharistic bread a participation in his body? Of course it is — you all know it! The word we see rendered in English as “participation” is the Greek word koinonia. By this word, St. Paul signifies a mystical union between Christ and the Church — the very substance of what it means to be a Christian. 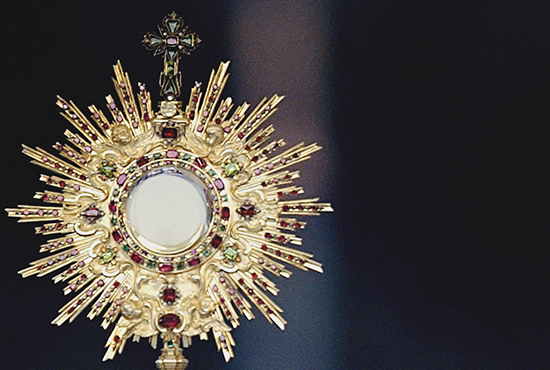 In celebrating Corpus Christi, the Church has always known that in her eucharistic celebrations, Christ is truly and really present in the elements of bread and wine. In the Eucharist, like Israel, we remember the saving and life-giving acts of God, acts that make us all one in the koinonia of the Lord’s table. This is the universal celebration in honor of the abiding divine presence in the world. Let us keep the feast! Deacon Hagan is in formation for the priesthood at the St. Paul Seminary for the Archdiocese of St. Paul and Minneapolis. His teaching parish is St. Vincent de Paul in Brooklyn Park. His home parish is St. Agnes in St. Paul. How can we be “living monstrances,” carrying Christ to others?